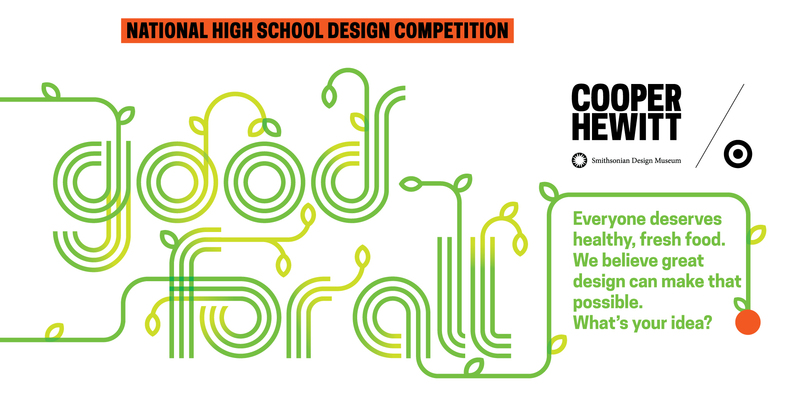 Cooper Hewitt, Smithsonian Design Museum launched the National High School Design Competition in collaboration with Target in 2016. In the inaugural year, high school students around the country were challenged to design an outdoor chair for Cooper Hewitt’s garden that is functional, comfortable, and unexpected—and inspired by an object from the museum’s world-renowned collection. In 2017, students were challenged to design a solution that improves a community’s access to healthy, fresh foods. Submit designs for a unique item meeting each year's specifications. Impact: Large or small, what is the impact of your design? Relevance: Does your design address the obstacles faced in the identified community? The National High School Design Competition is organized in two stages. In Stage One, competitors will create and submit their design ideas per the entry requirements. Cooper Hewitt will select three finalists to proceed to Stage Two of the Design Competition. All Stage One entries will be judged anonymously. During Stage Two, the three finalists will finalize their designs according to the requirements in the National High School Design Competition: Stage Two Brief document, which will be sent ONLY to the selected finalists announced on April 7, 2017. Each finalist will participate in a mandatory individual videoconference or phone call with an assigned mentor during the week of April 10 or 17, 2017 for initial feedback. Finalists will travel to Boston to attend a Mentor Day on May 13, 2017 with mentors, who will assist in finalizing their designs and review their presentations before meeting with the judges. Finalists will travel to New York City to present their designs in person to the judges on June 4, 2017.